This circa 1100 styled, one-handed axe has a steel head pinned to a hardwood shaft that is curved at the end. Back spike for effectiveness as a weapon. Overall length 23-1/4 inches. This medieval throwing axe inspired by the Frankish ones has a rustic forge finished blade and a curved wooden shaft. Overall 18 inches. This replacement curved shaft fits our Francesca axe. Made of stained Indian Sissoo hardwood by Windlass Steelcrafts. Overall length 18-1//4 inches. Surprisingly simple, but well made and functional axe. Easy addition to any collection. 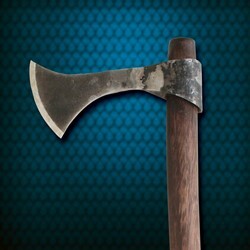 This axe is a very nice offering from Windlass. It is light and very maneuverable. The finish on mine is quite nice, better than the picture here on the website. The price is very reasonable and I definitely recommend it. marvelous object, perfect for riding a bike and chopping dogs. Excellent medium size fighting/throwing axe. I love the old timey blacksmith look they give the axe head, and for the price it just can't be beat. I have one at the moment, am considering ordering 2 more to be more historically accurate. Factoid: The Franks would use the slightly curved handles not only for more accurate throwing, but if they were to miss their target the axe would continue to spin and "bounce" at the Roman masses. Terrifying!! All in all an excellent buy and MRL/ACC sells replacement shafts for cheap. The axe head is thick, heavy, and a beast. It comes unsharpened but the design would naturally hook, tear, and shred anything it hit. This is my go-to Ren Faire axe. It is sturdy, good looking, and goes well with my ranger outfit. Excellent price too.